I made it well into my twenties without experiencing the glory (glory!) that is a patty melt sandwich. How I turned out so successfully eating only regular old sandwiches will remain a mystery. I kid, but truly, we’d all be better off with more pleasure in our lives, and the grand old patty melt delivers pleasure in spades. It’s like the love child between a hamburger, a grilled cheese, and a bowl of French onion soup. 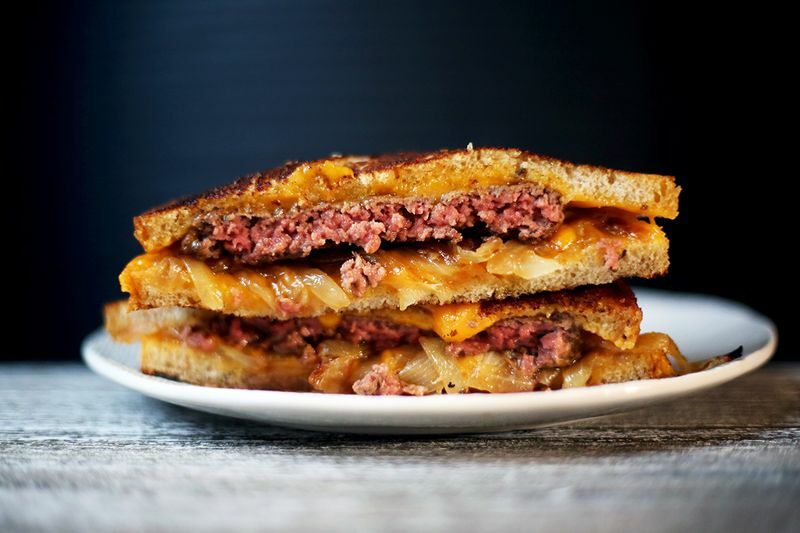 As far as a sandwich goes, the patty melt fires on all cylinders, combining griddled rye bread with a perfectly cooked round of savory ground beef, gooey cheese, and a tangle of soft, caramelized onions. You get all sorts of textures in each bite: crisp toasted bread and melt-in-your-mouth ribbons of onion and hot, oozing cheese. The beef is salty and laced with ground pepper and a touch of Worcestershire sauce. The onions are sweet and buttery. It’s the culinary embodiment of “the whole is more than the sum of its parts”—patty melts are simple and straightforward, but the end result is killer. One bite, and you can understand why such a basic diner staple has withstood the test of time. 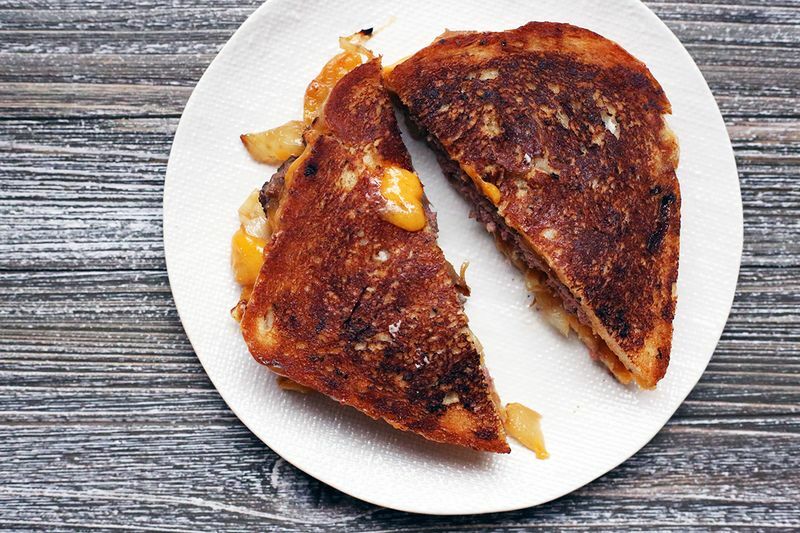 Best of all, it’s wickedly easy to put together a very good patty melt. You don’t need (and shouldn’t add!) any bells and whistles. You don’t even need a recipe! Just follow the basic template, executing each component well; start with good ingredients; and you’re on your way to dinner bliss. Note that caramelizing onions takes a very long time. There’s just no way around this. People will tell you about all sorts of silly hacks and shortcuts but to get maximum flavor and texture, you have to cook them low and slow. 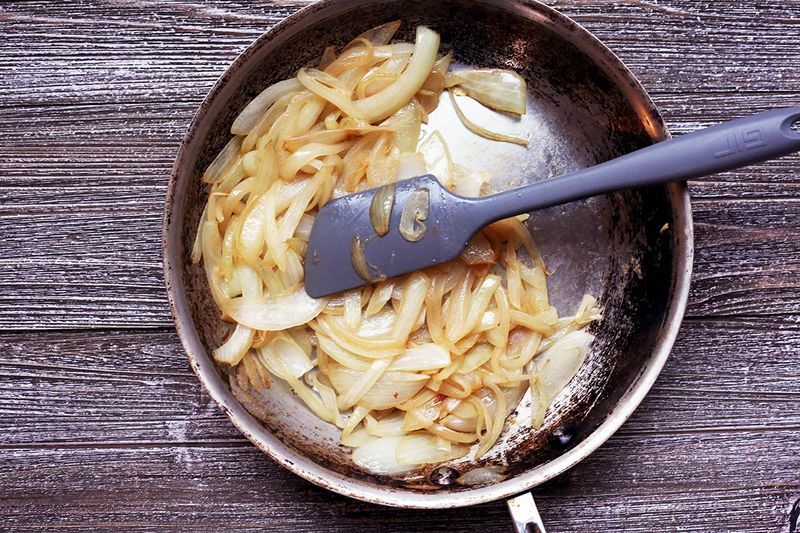 Add butter or olive oil to a large pan, set over medium heat, and lots of thinly sliced yellow onions. Don’t crowd the pan too much. Cook the onions for at least 30 minutes, stirring occasionally. If they’re browning too quickly and sticking, turn the heat down slightly and add a splash of water. The onions are ready when they start to turn a deep golden caramel color. They should be very soft. Add a little salt! The size of the patty depends on your bread: You want to shape the meat into a thin round that’s roughly the shape of your slice of bread, perhaps little larger, since the meat will shrink in cooking. You can get crazy with flavors if you want (Dijon? Sriracha? herbs galore? 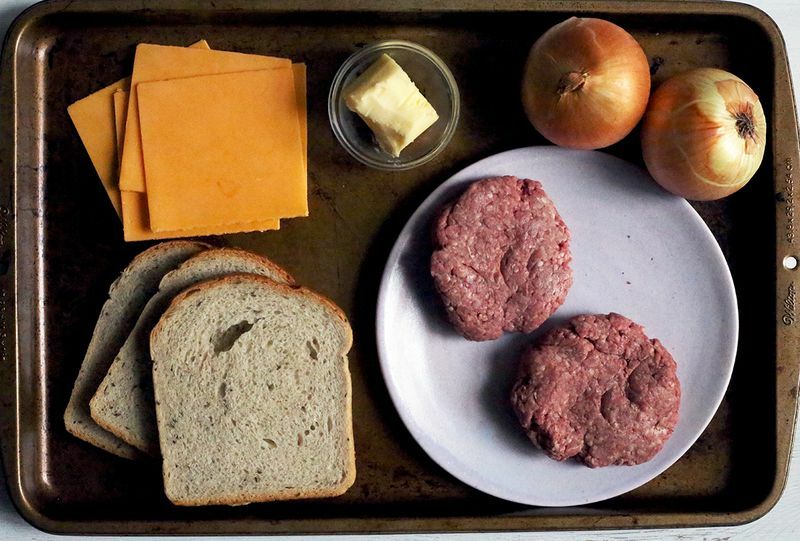 ), but the simple and classic patty melt only requires ground beef seasoned with salt and pepper. I add a dash of Worcestershire sauce when mixing and shaping the ground beef. It really helps to amplify the savory flavor of the meat. 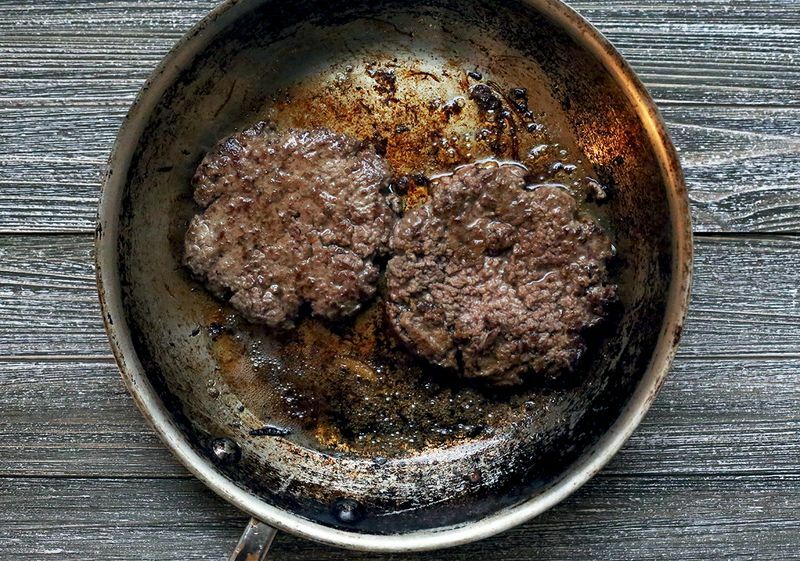 Cook the patty in a skillet until your desired doneness—I go for medium rare. Remove the patties but don’t wipe out the pan. You can (and should) cook your sandwiches in the fat that remains, which will give it a nice meaty flavor. Cut two slices of rye bread. Could you use other types of bread? Sure. But it won’t taste like a true patty melt. (But hey, it's your call.) Place a few slices of sharp Cheddar cheese (or a mix of good melting cheeses like Swiss or American or provolone) on top of one of the slices. Next, add your cooked patty, a generous handful of caramelized onions, then some more cheese. Top it with another slice of bread. Back to the Heat You Go! Spread the outside of each slice of bread liberally with mayonnaise, which will help it brown better than butter. In the same skillet you used for the meat, cook the sandwiches for a few minutes on each side, pressing down with a spatula until the cheese melts and the bread is golden. 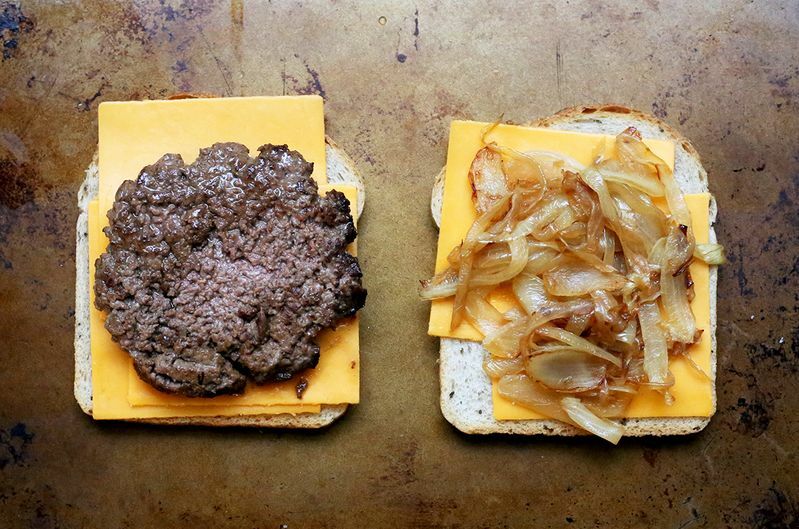 And there you have it: a perfect patty melt, no recipe required. A milkshake for dessert is optional but recommended. Is there anything more comforting than a cheesy patty melt sandwiched between two golden-crisp slices of bread? Create ooey-gooey goodness in your own kitchen with a few of these inspired (and delicious!) panini recipes: Roast Beef Panini, Grilled Chicken and Roasted Pepper Panini or Plum and Brie Dessert Panini.